providing a platform for scientists, experimentalists, research centers to discovering dynamics of scientific progress and new trends of scientific topics over scientific network. Sep. 2014, a project related paper ''Social Role Identification via Dual Uncertainty Minimization Regularization" has been accepted in the 14th IEEE International Conference on Data Mining (ICDM 2014). April 2014, a project related paper ''Batch Mode Active Learning with Hierarchical-Structured Embedded Variance" has been accepted in 2014 SIAM International Conference on Data Mining (SDM 2014). Nov. 2013, a project related paper "Bootstrapping Active Name Disambiguation with Crowdsourcing" has been accpeted the 22th ACM International Conference on Information and Knowledge Management (CIKM 2013). Figure 1. The platform of EAGER. 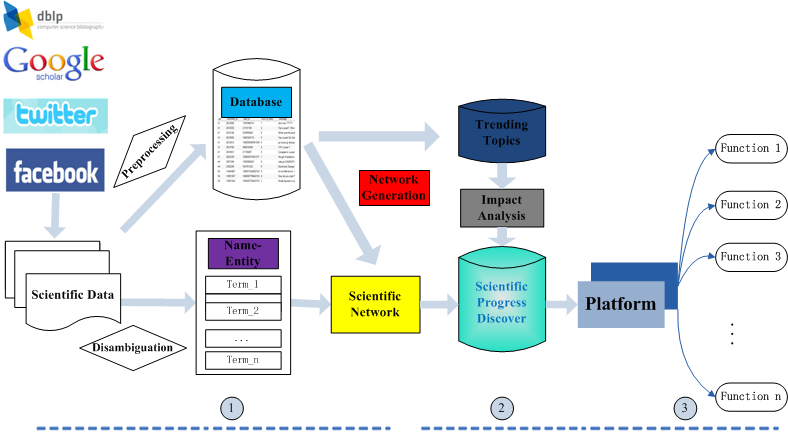 (1) System to collect hetergenerous data from web, and preprocessing steps: author names disambiguation and missing data inference; (2) Models which consist three parts: discovering dynamics of scientific progress, new trends of scientific topics and research impact analysis; (3) An infrastructure to provide all the above functions to mine the scientific data. Yu Cheng, Ankit Agrawal, Huan Liu, and Alok Choudhary. "Social Role Identification via Dual Uncertainty Minimization Regularization". In the international Conference on Data Mining, December 2014 in Shenzhen, China. Yusheng Xie, Zhengzhang Chen, Diana Palsetia, Ankit Agrawal, and Alok Choudhary. Indexing Bipartite Memberships in Web Graphs. In the international Conference on Advances in Social Network Analysis and Mining, August 2014 in Beijing, China. Yu Cheng, Zhengzhang Chen, Lu Liu, Jiang Wang, Ankit Agrawal, and Alok Choudhary. Feedback-Driven Multiclass Active Learning for Data Streams. In the 22th ACM International Conference on Information and Knowledge Management, October 2013. Yu Cheng, Zhengzhang Chen, Jiang Wang, Ankit Agrawal, and Alok Choudhary. Bootstrapping Active Name Disambiguation with Crowdsourcing. In the 22th ACM International Conference on Information and Knowledge Management, October 2013. Lu Liu, Jie Tang, Yu Cheng, Ankit Agrawal, Wei-keng Liao, and Alok Choudhary. Mining Diabetes Complication and Treatment Patterns for Clinical Decision Support. In the ACM International Conference on Information and Knowledge Management (CIKM 2013). Kathy Lee, Ankit Agrawal, and Alok Choudhary. Real-time Disease Surveillance Using Twitter Data: Demonstration On Flu And Cancer (Demo). In the 19th ACM SIGKDD International Conference on knowledge Discovery And Data Mining, pp. 1474–1477, August 2013. Kathy Lee, Ankit Agrawal, and Alok Choudhary. Real-Time Digital Flu Surveillance using Twitter Data. In the SDM Workshop on Data Mining for Medicine and Healthcare (DMMH), pp. 19–27, May 2013. Yu Cheng, Yusheng Xie, Kunpeng Zhang, Ankit Agrawal, Dan Honbo, Alok Choudhary, "CluChunk: Clustering Large Scale User-generated Content Incorporating Chunklet Information" is an accepted workshop paper at ACM SIGKDD Conference on Knowledge Discovery and Data Mining, August 12-16, 2012 in Beijing, China. Yu Cheng, Yusheng Xie, Kunpeng Zhang, Ankit Agrawal, Dan Honbo, Alok Choudhary, "How Online Content is Received by Users in Social Media: A Case Study on Facebook.com Posts" is an accepted workshop paper at ACM SIGKDD Conference on Knowledge Discovery and Data Mining, August 12-16, 2012 in Beijing, China. Diana Palsetia, Md. Mostofa Ali Patwary, Kunpeng Zhang, Kathy Lee, Christopher Moran, Yves Xie, Daniel Honbo, Ankit Agrawal, Wei-keng Liao, Alok Choudhary, "User-Interest based Community Extraction in Social Networks" is an accepted workshop paper at ACM SIGKDD Conference on Knowledge Discovery and Data Mining, August 12-16, 2012 in Beijing, China. Yusheng Xie, Yu Cheng, Daniel Honbo, Kunpeng Zhang, Ankit Agrawal, Alok Choudhary, "Crowdsourcing Recommendations From Social Sentiment" is an accepted workshop paper at ACM SIGKDD Conference on Knowledge Discovery and Data Mining, August 12-16, 2012 in Beijing, China. Yusheng Xie, Daniel Honbo, Kunpeng Zhang, Yu Cheng, Ankit Agrawal, Alok Choudhary, "VOXSUP: A Social Engagement Framework" is an accepted workshop paper at ACM SIGKDD Conference on Knowledge Discovery and Data Mining, August 12-16, 2012 in Beijing, China. Kunpeng Zhang, Yu Cheng, Yusheng Xie, Ankit Agrawal, Alok Choudhary at Special Interest Group on Information Retrieval (SIGIR), August 12-16, 2012 in Portland, Oregon. This work is supported by the National Science Foundation, Office of CyberInfrastructure (OCI), under award number OCI-1144061.